Today, Nokia has launched a new device in India named Nokia 301. Nokia 301 is not an Asha series phone and it’s a dual SIM supporting feature mobile phone. Nokia 301 has got its design inherited from the Lumia devices. Nokia has already launched Lumia design inspired touch phone named Nokia 501 in India but this one holds on to alphanumeric keypad. Let me take you to the specifications of the Nokia 301. I’ve already discussed about the design of Nokia 301 so I’m starting the specifications from display. It got 2.4inch TFT display having 167 ppi pixel density and resolution of 240×320 pixels. 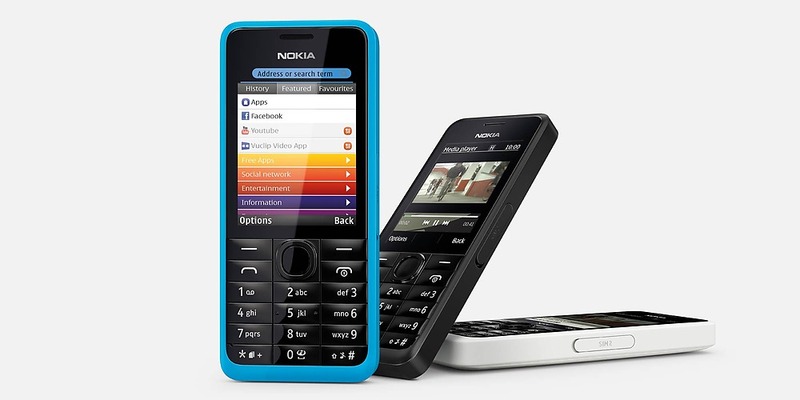 The identical display has been already used in the newly launched Nokia Asha 210. Nokia 301 weighs just 102 gram and it measures 114mm in length, 50mm in width and just 12.5mm in thickness. The storage department holds on to 64MB of RAM, 256MB of ROM and there is little bit of internal storage as well but users have to rely on the external storage. Yes, the Nokia 301 has got slot for storage expansion supporting microSD card of maximum 32GB size. Nokia 301 comes preloaded with 3.2MP camera at rear which Nokia is calling a smart camera. The rear camera has got features like Panorama, special effects, sequential shots (burst mode capturing five shots in one click) and video recording at 30 frames per second. The camera can be operated with voice instructions that means self portrait can be taken easily with the rear camera of Nokia 301. Nokia has provided high speed 3G data speed connectivity in this mobile phone. It offers 7.2mbps download speed at 3G cellular network and upload speed of 5.76mbps have been reported. In India, the 3G network is still not available widely so staying on 3G data plan is always a challenge for the user. Let see what speed it offers in reality on 3G network. There is no Wi-Fi feature to let you connect on WLAN network but there is Bluetooth (v2.1) with A2DP and EDR features. 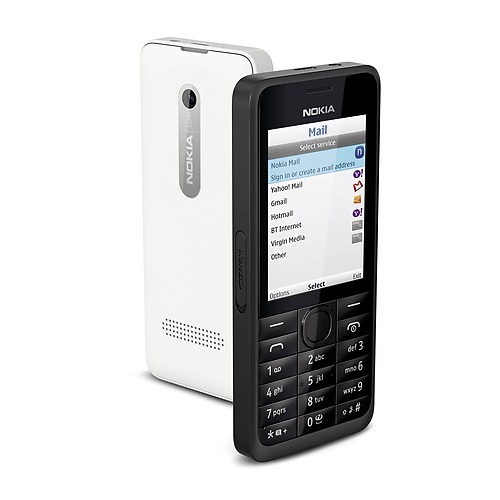 The battery of Nokia 301 offers continuous talk time of 6 hours on 3G network and of more than 15 hours on 2G. This shows that the battery can easily keep the device alive for at least 2 days. BL-4U with 1110 mAh rating is the battery inside of Nokia 301. The Nokia 301 features WAP 2.0 mobile browser, FM radio, JAVA, SNS applications, predictive text input, in built call record feature and dual SIM card support. Twitter and Facebook are also preloaded inside the phone with Nokia’s new file sharing app named Slam. Nokia 301 is available in five colors, Yellow, White, Red, Blue and Black. Nokia has launched the Nokia 301 in India at a price of Rs 5349. The price of the mobile phone is higher than other phones offering similar features but as it’s from Nokia so people will definitely go for it.